All of the students were successful on the course. The level of performance was high and this reflects their academic backgrounds and application to their studies. The External Examiner met the students and his feedback was very positive. A questionnaire survey was conducted after the course and the feedback was very encouraging. On a scale of one to six, the students rated their overall satisfaction with the course at 5.7 which is extremely high. They also felt that the content of the course was very relevant to their needs and that the amount of time devoted to each subject was about right. The Pitman Training days on Personal Effectiveness, Decision Making and Communication were all well-received. They also found the course very demanding and would have liked more free time for doing assignments. However this is an intensive course and it is unlikely that more time will be found in future. Students would like to see more input on Leadership, Marketing, Strategic Planning and Training Needs Analysis. However they considered that the course was extremely relevant to their jobs and well coordinated and planned. Overall the feedback was very positive. A very pleasant and successful presentation evening was held with Tutors, Trustees and Friends of BOAT at Escot House at the end of the course. Trustees are grateful to John- Michael Kennaway and his wife Lucy for making their wonderful house and grounds available to BOAT for this purpose. John-Michael presented the Certificates to the candidates and gave a fascinating account of the history of Escot and its current operations. The photograph shows the group on the steps of Escot House after the event. 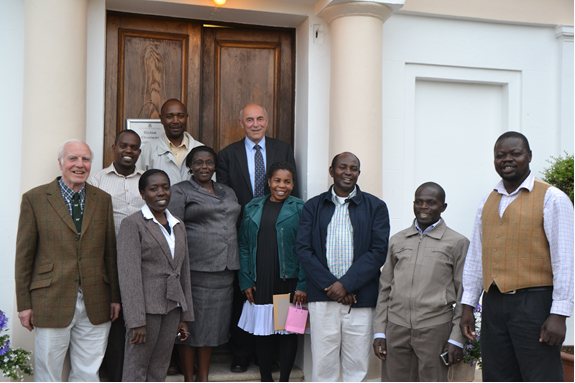 From left to right: Mike Pash (Course Coordinator), Nelson Makezi, Josephine Yongo, Kenneth Mukalazi, Joyce Tibananuka, Fred Harper (Chairman), Pamela Kusolwa, Peter Murage, Julius Tumwebaze from Food for Thought Uganda (linked to Devon Development Education in Exeter) and Joseph Mugagga.